Sky Valley Preschool Academy is an academic preschool program offering students a variety of learning opportunities through many different activities. Each day students have circle time, age appropriate math, science, phonics, letter and sound recognition, writing, reading, arts and crafts in a self esteem building environment. Each day students have a gymnastics class with a coach in their own 10,000 sq ft gym. Students will learn preschool skills on vault, bars, beam, floor, tumbling pit, trampoline, rock wall. They will also have a half an hour of free play and game time also. Sky Valley Preschool Academy is devoted to your child. We strive to give your child the best foundation of early childhood education, both academically and physically. We believe building confidence and self esteem will help develop a well rounded child. *All Classes focus on each individual child's ability and readiness to learn. Students Arrival: Children participate in quiet activities as students arrive. Centers are set up with different activities. Recess Time: Students have open gym play time in the gym along with organized games, with teaching activities. Centers and Craft concurrent to the monthly theme. Snack is served after which half the class goes to gymnastics class with a coach and the remaining students will have group learning time with the teacher. After a half an hour the groups will flip. Then we will get ready to go home or have lunch if your child stays all day. The preschoolers will participate in a half hour gymnastics class with a coach each day. Our goal is to teach the basics of preschool gymnastics. Children be learning beginning skills on vault, bars, beam, floor, trampoline, tumbling pit, rock wall and tumbling activities on the floor. You will receive a progression sheet with skills & routines they will learn during the school year. Each child will progress through the skills at an individual rate. You may bring a change clothes for gymnastics class or dress for the day in clothing appropriate for gymnastics class. Please be sure to bring an extra change of clothes in case of potty accidents. Tuition is due by the 1st of each month. There is a 10 day grace period, if received after the 10th of the month there will be a $25.00 late fee applied to your account. Please contact us if your tuition payment will be delayed. Tuition is based on the school year divided by 10 months. You may sign up for auto pay that will be charged on a card kept on file on the 5th of each month. You may send payment via your own personal bill payer set up through you own bank. Address: 16891 146th St SE # 115 , Monroe, Wa. 98272 (Put your child's name in the memo line. Discount - If you pay your tuition in full by August 31, you last month will be free, which is equivalent to 10% off. (There are no refunds on tuitions paid in full, moneys can be transferred to recreational classes). You must give a 30 day written notice if you are discontinuing classes. You are responsible for all payments through your given notice. If no notice is given your account will be charged for the month. There is no refund for registration or a years tuition paid in full. Please be on time to class, you must sign your child in and out each day. There is a sign in sheet in each classroom by the door you enter in. Do not show up to class more than 5 minutes early or 5 minutes late. If you are more than 5 minutes late picking up your child you may be charged a fee of $10.00 for every 10 minutes you are late. Please call if you will be late picking your child up from class. Children get worried when everyone has gone and they are the only one at school. Please call the office if your child will not be attending class. You may bring a back pack big enough to hold notebook sized paper and big enough for projects. Bring clothes or wear clothing appropriate for gymnastics class. If your child wears a dress to school please provide shorts to wear under the dress. Please pack extra clothing in case of accident. If your child stays at school all day they will be offered a rest time after lunch. We will supply a mat. You are responsible to send a sheet and cover for your child to use. The washables will be sent home on Fridays and must be returned to school on Mondays. Check folders daily for important information. 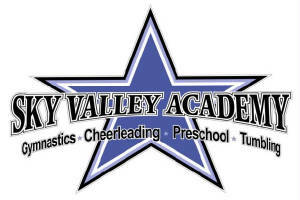 Also check the website (skyvalleyacademy.com) for updates and additional information pertaining to class events. This is our way of communicating any changes with you. Field Trips are included in your registration. On occasion there may be a special field trip planned that you will be responsible to pay for. Please turn in permission slips for field trips on time. You must sign a permission slip for your child to join us on field trips whether you are present or not. Your child will be transported by private vehicle. If you choose to drive you must provide us with a valid drivers license and valid proof of insurance. Siblings are typically asked not to attend fieldtrips as we have a lot of students. If you accompany us on a field trip we want you to be able to give all your attention to students. Please visit your child's teacher's web page. This will provide access to when we have school closures, monthly themes and field trips etc. You can find the web sites at skyvalleyacademy.com and then go to the teachers link. Please check the website due to inclement weather. This is where you will find information regarding closures due to bad weather. Situations may occur that are out of our control that may cause the school to be closed. turn to bring snack to class. Snack consists of a Protein, Carbohydrate and Real Fruit juice. All foods brought to school must be store bought, due to allergies. If your child stays all day you are responsible to bring a healthy sack lunch for your child. If your child is sick, has gold or green runny nose, or a cough do not bring your child to school. If your child has had a fever, diarrhea or has vomited in the last 24 hours please keep them home. Call the school and let them know that your child will be absent. If your child becomes ill at school you will be called immediately. You must pick up your child in a timely manner. If your child has any allergies food or otherwise or develops any allergies during the school year it is your responsibility to provide the information to your child's teacher and office staff. Parents and guardians will be informed if the classroom has a pet. Children will have supervised access to pet. After the child has touched the pet they will be required to wash their hands. Pets will be kept in cage for the majority of the day. If required pets will be immunized. Adults will clean and remove waste on a daily basis. Our policy is as follows: Time out is used as a time to gather one's self. When the child is ready to re enter the group they are welcomed back. Time out will never last more than 1 minute per year of age. Time out is rarely used as we try to use reason and choice as our first line of discipline. If a child is uncontrollable on a consistent basis they maybe asked to un-enroll from our program. If you are a DSHS client and miss more than five days you will be dropped from the program. Parents may view our Health and Emergency Plan located in the Director's office.